Coll. No. 1412, 10 Jun 2016, characters observed: Biennial or short-lived perennial, to 33 cm., proximal hairs 2-rayed; Sepals, 9 mm. ; Petals, 16-19 mm., orange; Anthers, 3.5-4.0 mm., Fruit, 34 mm. × 0.7 mm., ascending; Seed, unknown. Weak evidence that this might be var. 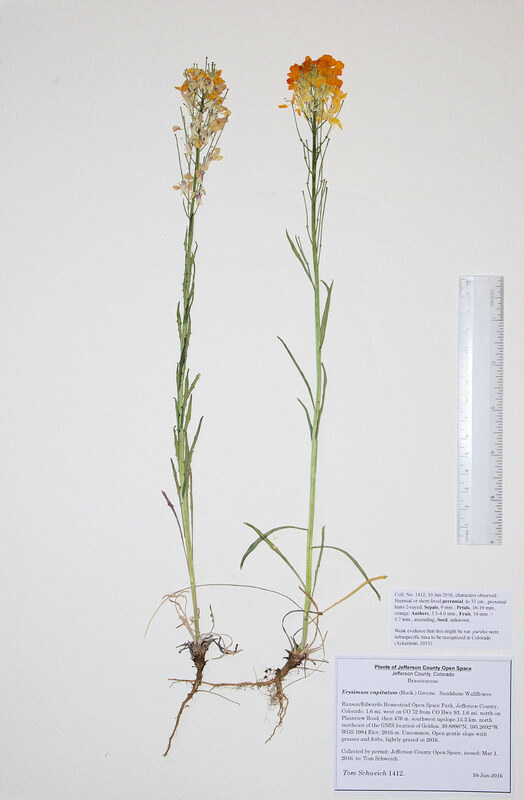 purshii were infraspecific taxa to be recognized in Colorado (Ackerman, 2015). Field Notes: Coll. No. 1412, 10 Jun 2016.